In 1995, the enclave of Srebrenica, which the UN declared to be a ‘safe area’ during the war in the former Yugoslavia, was overrun by Serb troops. Srebrenica counted about 40.000 Bosnians. The UN Blue Helmets from the Netherlands who had been stationed there were unable to defend the area. The aggressors, commanded by General Ratko Mladic, killed many thousands of Bosnian men. About 7500 persons are still missing. Many of them were found dead in mass graves in the following years. How could this atrocity have been prevented? What was the role of the Netherlands Blue Helmets, the UN and the allies? This mass murder gives rise to many questions. In this book, Joris Voorhoeve added new material to the many existing studies. The book also investigated fourteen other cases of very vulnerable concentrations of civilians and refugees who faced serious risks of mass murder in different countries and regions. The purpose of the book is to help design better ‘safe area’ policies of the UN, based on the failures of the past. The book draws fifty important policy conclusions to that end. The author, who served in the Netherlands Cabinet at the time, concludes that timely use of air power is the crucial means to save such population groups. 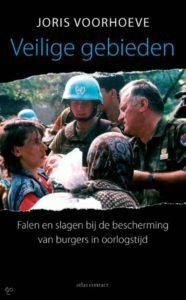 His hypothesis, that in the case of Srebrenica the UN Secretary-General was unwilling to keep promises to the Netherlands Government that adequate air power would assist the lightly armed and small group of peacekeepers, was a crucial omission. Also, Britain and France had agreed with the US not to apply air power against the Serb military at that time. The enclave fell due to lack of support. The contents of this book were the subject of an hour-long prime-time television documentary in 2015. This was followed by an official investigation, ordered by the Netherlands Cabinet, into the policies of the three allies. Unwillingness to share intelligence files of that time led to an inconclusive debate, which cast doubt on the assumption that lack of air power was crucial. The author maintains this assumption, however. How can we survive the future if climate change, civil wars and conflict over resources increase the tensions in the world? One out of seven persons is suffering from hunger. Meanwhile, the world population is growing. The interdependency between the growing consumption of the rich and poverty and corrupt administrations in third world countries, as well as the spread of weapons and new diseases will become disastrous if policies don’t improve. In Negen Plagen Tegelijk, Joris Voorhoeve explains what citizens can do and how the Netherlands might be able to contribute. He also describes how the European Union and the UN can approach major challenges. Stories of people who fight for better policies show that inspiring persons can make a big difference. They encourage the reader to confront the threats and challenges of the 21st century. Joris Voorhoeve (1945) is a liberal politician. Since 1980, he is professor in international developments at various universities. From 1991 – 1994, he was director of the Clingendael Institute. The succeeding four years he served as Minister of Defense of the Netherlands. Greece’s Engagement Strategy Towards Turkey. The Impact of Europeanization. Although it is assumed that the improved atmosphere in Greek-Turkish relations since 1999 is composed of the initiatives undertaken by both sides the paper self-consciously restricts its case-study to the contribution to this evolution on behalf of the Greek side. 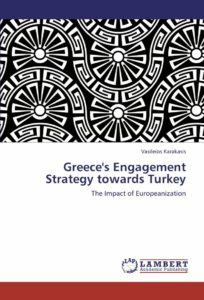 Europeanization of Greek Foreign Policy and Greece’s Engagement Strategy towards Turkey during the last decade constitute topics in the name of which a lot of literature has been developed. The aim of this thesis is to establish a link between them. How is Europeanization able to influence and shape the formulation of an EU member state strategy? How can it contribute to the adoption of a strategy especially in cases where the targeted state does not belong to the EU family and is perceived to hold revisionist aspirations? Why does the currently employed strategy seem according to the today’s Greek Foreign Policy Makers the proper solution to deal with their security concerns? Assuming that the adoption of this policy is of strategic importance the author is interested to highlight the indicator behind this decision and to illustrate the way this strategy was interpreted and pursued. This book on the foreign relations of the Netherlands shows how broad and intensive the diplomacy of a modern Small Power can be. Much of the literature on world politics has been written from the perspective of the Great Powers. Small Powers are dealt with as props on the world stage. However, the large majority of states has a different vantage point: that of middle-sized or small participants. They have to pursue their goals with only a fraction of the Super Powers’ resources against often overwhelming international forces. Dutch foreign policy is interesting not only because of its historical evolution but also because it exemplifies modern interdependence among states. As an open trading nation, located at the cross-roads of Western Europe, as a participant in the process of European integration and an active member of many international organizations, as a nation whose public, interested in global affairs, is often eager to set an example of idealistic behavior for other states, the Netherlands portrays the many complexities of contemporary international relations. 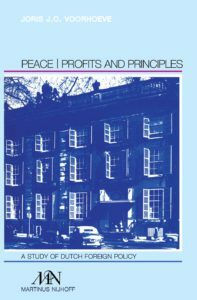 Peace, Profits and Principles is not an official publication, but a private study. It combines the classical approach to International Relations with some of the more quantitative and economic elements of the contemporary approaches. The organization of the material and the extensive bibliographies on Small Power behavior and on Dutch foreign policy make this book suitable as a comprehensive source on the international relations of the Netherlands and as a case study for use in comparative foreign policy analysis and the general study of Small Powers. The Research Group (Lectorate) on International Peace, Justice and Security of The Hague University of Applied Sciences and the Sen Foundation are writing a Dutch textbook on international relations. This textbook includes chapters on economics, history, international relations theories, international and regional organisations, states and international development cooperation, international law and global issues. The textbook will be used by bachelor students at research universities (WO) and universities of applied sciences (HBO) in the Netherlands. The book is due for publication in 2018 by an educational publisher and is written by professors, researchers, lecturers and research interns. Ten Scourges at Once: How Do We Survive the Future? Ten Scourges at Once: How Do We Survive the Future? This e-book is an expanded and updated English translation of the previously published Negen plagen tegelijk (2011), which looks into various global problems such as the growing world population, food insecurity and hunger, extremely unfair division of resources, violent conflicts and tensions, weak or malicious government and other international issues. The mixture of such trends will become disastrous if not turned around by better policies at the local, national and international level. This book demonstrates what can be done to tackle the global challenges of the near future by international organisations, governments and ourselves. The personal stories of people who fight injustice prove what a world of difference inspired individuals can make. This e-book will be published soon. By 2050, world population is expected to have reached 9,7 billion. Indians will constitute the biggest group followed by Chinese. And by the end of this century, there may be as many Nigerians as citizens of the European Union. Our world will change significantly. But our human desires stay the same: sufficient food and water, a nice family, an interesting job, a reasonable income, health, peace and security and much more. This is what Tom Koene tries to keep hold of in his photo series. As aid worker for Doctors without Borders and as photographer he has travelled and seen a significant part of the world. Joris Voorhoeve, who contributed the comments on the pictures, has seen much as a chair of Oxfam Novib and Oxfam International. Because pictures speak louder than words, these photos show a variety of people who are, despite their differences, quite comparable in their needs and desires. The book is expected to be published in autumn 2017.